St. Peters – His Excellency Governor Eugene Holiday paid a working visit to Sr. Magda Primary school on Thursday, February 25, 2014. This working visit is part of the Governor’s program to obtain a firsthand view of developments in the community and forms part of his objective to promote Education, Culture and Sustainable development. Upon arrival he received a warm welcome from the pupils who sang the school song. During the visit the Governor was informed about developments and a number of programs at the school by the school manager, Mrs. Jacqueline Holiday, deputy school Manager Mrs. Janneke Vonk and other staff members as well as by the Executive Director of the Catholic School Board Mrs. Lilia Avonturin. During the meeting with the management, fourth grader Demani Mussington showed interest in the function of the Governor as he interviewed Governor Holiday about his role and activities. 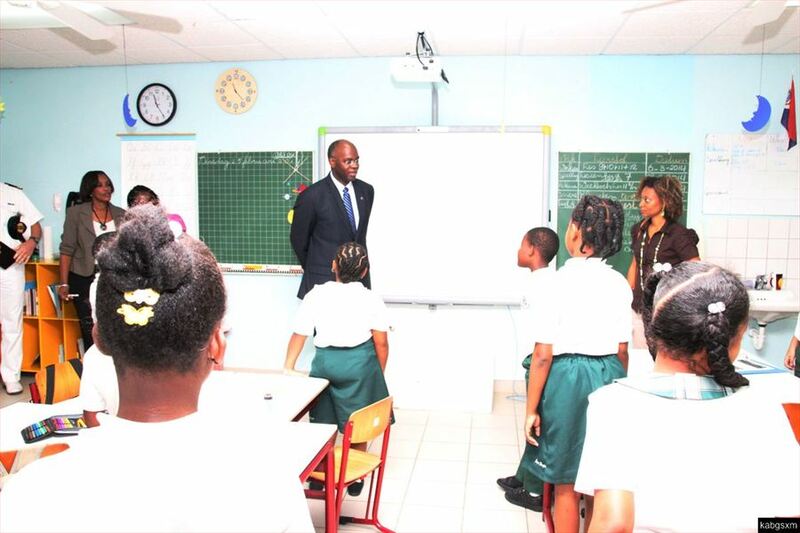 Governor Holiday concluded his visit with an extensive tour of all the classes of the school interacting with and answering questions from the pupils. In doing so he stressed the importance of education, good behaviour and serving your country. Governor Holiday was pleasantly surprised with the black history month presentation about him as Governor by pupil Shadee Richardson. He applauds the work of the board, the management and teachers in general and more specifically for the attention for the local reality in the curricula as well as for the use of information technology in the class rooms.